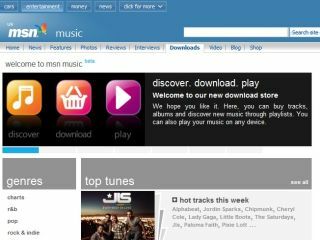 Microsoft has revealed that it has finally opened up the doors of its long-awaited music download service - MSN Music. The service was meant to be active back in July but was beset with delays. It is now up and running in open beta, offering over one million tracks from all the major labels, according to the company. "MSN Music service will offer a large and competitively priced music library. Offering a rich web-based experience, users can discover, play and download music," announces the release. "As well as enjoy features such as personalised playlist creation, the music library will constantly be updated along with artist information such as biographies and discographies. The music store will also integrate with the rich editorial content of the MSN Music channel." This idea of making the music service a portal to news and information about the bands you are listening to is similar to the recently announced Sky Songs platform. To access the site, you need to have a Windows Live ID but Microsoft assures us that all the music you download will be DRM-free. Interestingly, the company is also rolling out a free streaming service to rival the likes of Spotify. Although the details of this are sketchy, it's been announced that it will be a closed beta for the time being, with Microsoft explaining: "As part of the service, free music streaming will be tested on a limited basis. MSN will be running a series of promotions on the MSN website enabling a limited number of users to gain access to this aspect of the beta." As for prices. Microsoft is working on a credit system with 10 credits costing you £7.99. One credit gets you a single and 10 a whole album. For more information, point your browser to http://downloads.music.uk.msn.com/.